Active Directory Expiring Links is new feature in Windows Server 2016 which enables time-bound group membership, expressed by a time-to-live (TTL) value. It allows administrators to assign temporally group membership. This feature is not enabled by default because it required forest function level must be Windows Server 2016. Also, once this feature is enabled, it cannot be disabled. 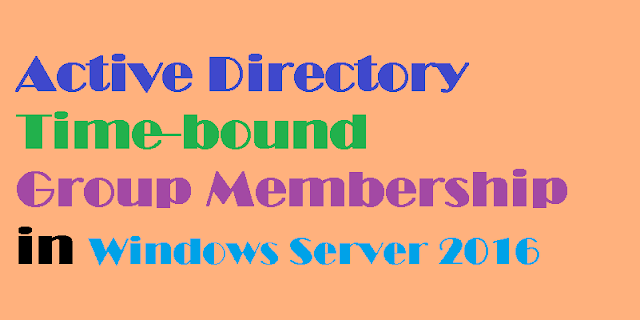 This article will guide you through the steps to enable active directory time-bound group membership in Windows Server 2016. Open up PowerShell and execute the following command to enable time-bound feature in active directory. Next step is to add the Jhon to the domain admin group for 20 minutes. The group membership will automatically be expired after 20 minutes. Finally Microsoft has introduced an excellent feature in active directory. Appreciating your guidelines.